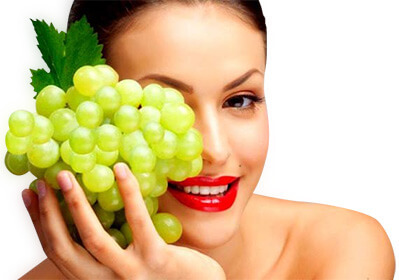 Grapes: A treatment for Acne? Resveratrol is a compound found in plants and red wine with antioxidant properties. This powerful antioxidant is produced naturally by several plants when the plant is under attack by pathogens such as bacteria or fungi, and has potential cancer preventing benefits (although evidence of this is inconsistent). The antioxidant resveratrol can be found in the skin of grapes, blueberries, raspberries, and mulberries. A new study by UCLA researchers describes how the antioxidant from grapes (resveratrol) works to stop the growth of the bacteria that causes acne safely. The study states that acne is the most prevalent (common) skin disease in the world with over 85% of adolescents and over 10% of adults said to be affected. Individuals that use antibiotics to treat their acne can eventually build a resistance to the drug and treatments such as retinoids and benzoyl peroxide can have side effects, such as irritation, that are undesirable. The causes of acne are vast with severity of the condition ranging from mild to severe. Mild acne suffers usually experience few, occasional pimples, and moderate suffers experience inflamed papules. Suffers of severe acne will experience large nodules and cysts. Primarily, the cause of acne is hormonal, often driven by ‘androgenic’ hormones. These hormones typically become active during teenage years. When combined with bacteria on the skin and fatty acids within oil glands, sensitivity to these hormones causes acne. Resveratrol works by stopping the formation of free radicals in the body, which cause cell and tissue damage. It also showed ‘sustained antibacterial activity’ against acne bacteria. Unlike, benzoyl peroxide which only ‘demonstrated a short term bacterial response.’ Resveratrol also has less cytotoxicity when compared to benzoyl peroxide. This means it’s less toxic to the skin cells that the medication isn’t supposed to target. However, the study by UCLA researchers claims that ‘acne is a multifactorial disease, attributed also to sebum production which is not currently known to be addressed by Resveratrol, and which may therefore limit its use as a monotherapy in the treatment of acne.’ Basically, there are many factors that can be the reason behind your acne, and the use of resveratrol as the only treatment for acne may reduce its success. Research has found that combining Resveratrol with commonly used benzoyl peroxide increases how much bacteria is killed. Suggestions that combining this antioxidant with benzoyl peroxide could lead to less irritating topical acne treatment, as it has effective antibacterial effects but minimal toxicity to other skin cells. Skin care products and skin care systems are often the best way to treat the appearance of acne, fade acne scars, and improve the overall quality of your skin. You can purchase Obagi skin care systems and Glo therapeutics from our clinic. Our therapists have a detailed understanding of the products available at our clinic, have received training and witnessed results firsthand. All you have to do is get in touch to book a free consultation, and our therapists will recommend a product suitable for your skin. Their expert opinion will ensure you achieve maximum results.